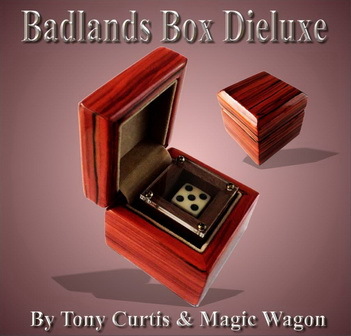 box from inside which has a clear window top and contains a small die. of the die inside so that a different number will show through the window. This proves very difficult to do as the die fits very tightly inside and has very little movement. 1 and 6 and the spectator for example selects the number 4. The performer now places the small box into the larger one and closes the lid. The spectator is now told to think of the number 4 and to tap the box with their finger four times. now showing on the top of the die visible through the window of the small box. by Viking Magic U.S.A. and has the VH logo stamped on its base. Manufactured in 2017 by Magic Wagon Thailand & Viking Magic America.